DEXAMENOS (Dexamenus) was a king of the Akhaian town of Olenos in the Peloponnesos. He was a close friend of Herakles who slew the Kentauros (Centaur) Eurytion when he tried to force a marriage with Dexamenos' daughter Mnesimakhe. Dexamenos was probably a descendant of Endymion through Epeios and Alektor (Alector). Alektor preceded him as king of Olenos and Dexamenos was in turn succeeded on the throne by--his son or brother?--Hipponoos. However, during the reign of Hipponoos, the country was invaded and annexed by King Oineus of Aitolia. Homer lists Olenos as an Aitolian possession in his catalogue of Trojan War kings and their cities. DEXAMENUS (Dexamenos), a king of Olenus, and the father of Deïaneira, whom Heracles seduced during his stay with Dexamenus, who had hospitably received him. Heracles on parting promised to return and marry her. But in his absence the centaur Eurytion sued for Deïaneira's hand, and her father out of fear promised her to him. 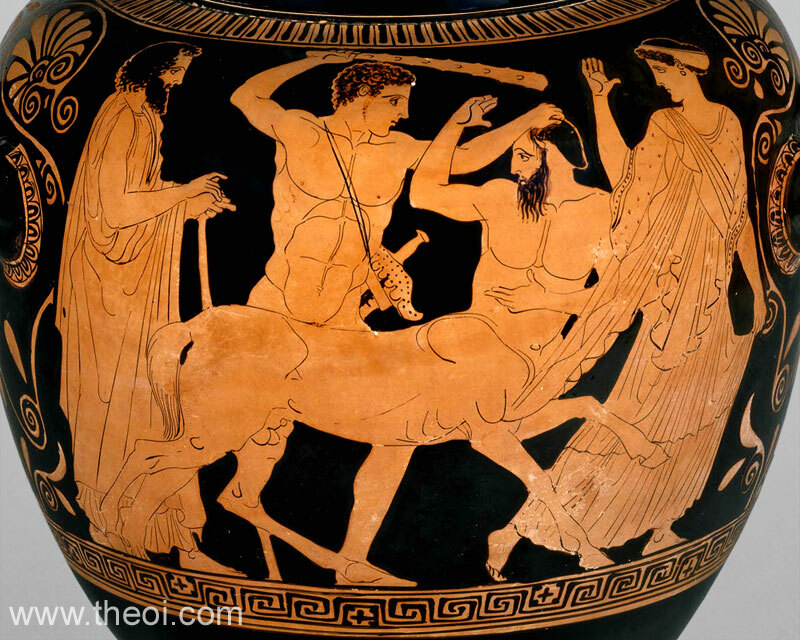 On the wedding day Heracles returned and slew Eurytion. (Hygin. Fab. 33.) Deïaneira is usually called a daughter of Oeneus, but Apollodorus (ii. 5. § 5) calls the daughter of Dexamenus, Mnesimache, and Diodorus (iv. 33) Hippolyte. According to the Suda the minor Athenian dramatist Iophon wrote a play titled Dexamenos which presumably told the story of Herakles and the Kentauros Eurytion. Cleophon also dramatised the story of Dexamenos. "[King Augeias of Elis refused to pay Herakles for cleaning his stables and arbiters were called in to settle the dispute.] The arbitrators having taken their seats, Phyleus [son of Augeias] was called by Herakles and bore witness against his father, affirming that he had agreed to give him a reward. In a rage Augeias, before the voting took place, ordered both Phyleus and Herakles to pack out of Elis. So Phyleus went to Doulikhion and dwelt there, and Herakles repaired to Dexamenos (Dexamenus) at Olenos (Olenus). He found Dexamenos on the point of betrothing perforce his daughter Mnesimakhe (Mnesimache) to the Kentauros (Centaur) Eurytion, and being called upon by him for help, he slew Eurytion when that Kentauros came to fetch his bride." "The Akhaian (Achaean) cities . . . Helike (Helice), the companion of Poseidon, and Boura (Bura), the steading of Dexamenos, the son of Oikeus (Oiceus)." "As for the sons of Lapithes, Phorbas went to Olenos (Olenus), from which city Alektor (Alector), the king of Eleia [Elis], summoned him to come to his aid, since he stood in fear of the overlordship of Pelops, and he gave him a share of the kingship of Elis; and to Phorbas were born two sons, Aigeus [Augeias] and Aktor (Actor), who received the kingship over the Eleians." "[After the completion of his Twelve Labours] Heracles returned to the Peloponnesos and set out against Aegeas [Augeias], since the latter had defrauded him of his reward. It came to a battle between him and the Eleans, but on this occasion he had no success and so returned to Olenos (Olenus) to Dexamenos (Dexamenus). The latter's daughter Hippolyte was being joined in marriage to Azan [an Arkadian prince], and when Herakles, as he sat at the wedding feast, observed the Kentauros (Centaur) Eurytion acting in an insulting manner towards Hippolyte and endeavoured to do violence to her, he slew him." "Some forty stades from Dyme the river Peiros flows down into the sea; on the Peiros once stood the Akhaian (Achaean) city of Olenos (Olenus). The poets who have sung of Herakles and his labours have found a favorite subject in Dexamenos (Dexamenus), king of Olenos, and the entertainment Herakles received at his court. That Olenos was from the beginning a small town I find confirmed in an elegiac poem composed by Hermesianax [Greek elegiac poet C4th B.C.] 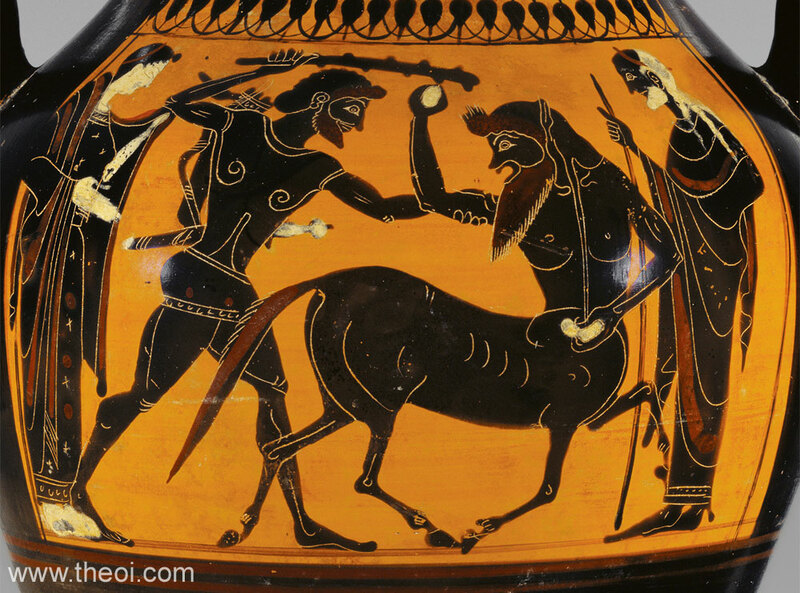 about Eurytion the Kentauros (Centaur)." "[In the Akhaian (Achaean) town of Patrai (Patrae) :] The sacrifice to Artemis of human beings is said to have ceased in this way. An oracle had been given from Delphoi (Delphi) to the Patraians even before this, to the effect that a strange king would come to the land, bringing with him a strange divinity, and this king would put an end to the sacrifice to Triklaria (Triclaria). When Troy was captured, and the Greeks divided the spoils, Eurypylos (Eurypylus) the son of Euaimon [or of Dexamenos, see below,] got a chest. In it was an image of Dionysos, the work, so they say, of Hephaistos (Hephaestus), and given as a gift by Zeus to Dardanos . . . Eurypylos opened the chest, saw the image, and forthwith on seeing it went mad. He continued to be insane for the greater part of the time, with rare lucid intervals. Being in this condition he did not proceed on his voyage to Thessalia (Thessaly), but made for the town and gulf of Kirrha (Cirrha). Going up to Delphoi he inquired of the oracle about his illness. They say that the oracle given him was to the effect that where he should come across a people offering a strange sacrifice, there he was to set down the chest and make his home. Now the ships of Eurypylos were carried down by the wind to the sea off Aroe. On landing he came across a youth and a maiden who had been brought to the altar of Triklaria. So Eurypylos found it easy to understand about the sacrifice, while the people of the place remembered their oracle seeing a king whom they had never seen before, they also suspected that the chest had some god inside it. And so the malady of Eurypylos and the sacrifice of these people came to an end, and the river was given its present name Meilikhos (Milichus). Certain writers have said that the events I have related happened not to the Thessalian Eurypylos, but to Eurypylos the son of Dexamenos (Dexamenus) who was king in Olenos, holding that this man joined Herakles in his campaign against Troy and received the chest from Heracles. The rest of their story is the same as mine. But I cannot bring myself to believe that Heracles did not know the facts about the chest, if they were as described, nor, if he were aware of them, do I think that he would ever have given it to an ally as a gift. Further, the people of Patrai have no tradition of a Eurypylos save the son of Euaimon, and to him every year they sacrifice as to a hero, when they celebrate the festival in honor of Dionysos." "When Phyleus [son of Augeas] had returned to Dulikhion (Dulichium) after organizing the affairs of Elis, Augeas died at an advanced age, and the kingdom of Elis devolved on Agasthenes, the son of Augeas, and on Amphimakhos (Amphimachus) and Thalpios. For the sons of Aktor (Actor) [i.e. the siamese twins Kteatos and Eurytos] married twin sisters, the daughters of Dexamenos (Dexamenus) who was king at Olenos; Amphimakhos was born to one son and Theronike (Theronice), Thalpios to her sister Theraiphone (Theraephone) and Eurytos . . . Incidentally this is shown by Homer in his list of the Eleians; he makes their whole fleet to consist of forty ships, half of them under the command of Amphimakhos and Thalpios." "Incidental labours of Hercules [Heracles] . . . He killed Eurytion the Centaur because he wooed Dejanira, daughter of Dexamenus, his hoped-for bride." "Seven Kings who set out for Thebes. Adrastus, son of Talaus by Eurynome, daughter of Iphitus, an Argive . . .
Tydeus, son of Oeneus by the captive Periboea, a Calydonian . . .
Capaneus, son of Hipponous by Astynome, daughter of Talaus, sister of Adrastus, an Argive. Hippomedon, son of Mnesimachus by Metidice, daughter of Talaus, sister of Adrastus, an Argive." 1. Pisa (southern Elis); 2. Elis (central Elis); 3. Bouprasion (northern Elis); 4. Doulikhion (island west of Elis); 5. Olenos (northern Elis & western Akhaia). * Eleios-Heleios is the same figure. One tradition represents him as a son of Perseus and the heir of King Pelops, another makes him a grandson of King Endymion. He was sometimes confounded with the sun-god Helios. ** Augeias ruled the whole of Elis including the regions of Elis, Pisa, Bouprasion and Doulikhion. After his death the kingdom was divided into four autonomous parts. *** Amarynkeus received a quarter of the kingdom of Augeias. One assumes his portion was Pisatis. **** In the reign of Hipponoos, Olenos was annexed by King Oineus of Aitolia. It is listed as an Aitolian dominion in Homer's Catalogue of Ships. Athenian Black Figure Vase Painting C6th B.C. Athenian Red Figure Vase Painting C5th B.C. Diodorus Siculus, The Library of History - Greek History C1st B.C. Pausanias, Description of Greece - Greek Travelogue C2nd A.D.